We undertook this audit of the Atlanta E911 Communications Center because our 2011 audit of Fire Department response times found that high E911 call transfer times contributed to the fire department’s inability to meet emergency response time goals adopted by the National Fire Protection Association (NFPA). Call processing time, defined as time elapsed from receipt of a call to dispatch of a fire apparatus, fell far short of meeting the national standard of processing 90% of calls within 60 seconds. 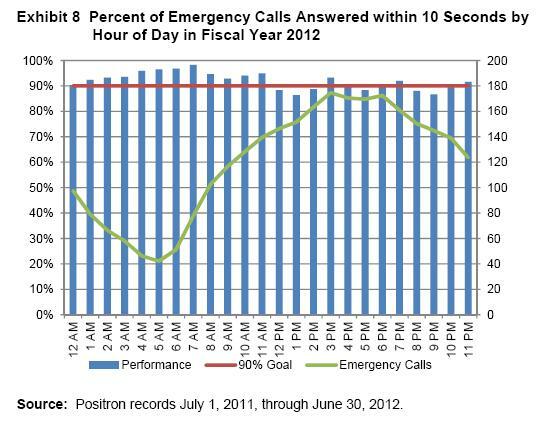 During fiscal year 2012 the center met its goal of answering at least 90% of emergency calls within 10 seconds. Although the center has not reached its goal of processing 90% of fire calls within 60 seconds, the center has improved its call processing time by implementing process changes. Time spent on calls was twice as high during afternoon and evening hours compared to early morning. Call takers spent close to 50% of their time on emergency calls in the late afternoon and early evening and spent about 25% of their time on emergency calls during the early morning hours. Although fire dispatch times improved, the center was still far from reaching the NFPA standard of dispatching 90% of fire calls within 60 seconds. Industry literature suggests that the 60 second benchmark may not be reasonable.